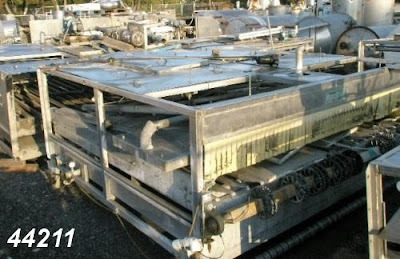 A used pasteurizer can be a great opportunity to offset capital costs. Studies show that internet searches on the topic of pasteurization have more internet searches for the words “used pasteurizer” than any other topic on pasteurization. While purchasing a used pasteurizer can be an opportunity, consider these points as the project progresses. • Look for a unit made completely of stainless steel. Older carbon steel tunnel pasteurizers, and yes even flash units with carbon frames suffer from erosion. • Consider the machines method of heating. The capital cost savings can be quickly paid back in steam, water, and electrical usage. Avoid units that are non-regenerative, coil driven, or direct steam injected. Remember that there is a significant value to condensate recovery! • A poorly controlled or incorrectly sized pasteurizer will fight itself by adding cool water and steam, often times simultaneously. • Machine size and zoning must be right for the machine to accomplish the process. This is not only the length, and width of the machine, but the speed of the belt, the flow rate of the water, and the heating characteristics of the product. Get professional confirmation that the sizing and zoning will match your production. • How the machine is removed is a key factor in the re-assembly. If the machine has not been removed, consider being there or taking owenership of the removal process. This could mean the difference between your getting what’s in the picture above or the difference between a machine that leaks or doesn’t. It’s also an excellent way to begin to get to know the equipment and will make the re-assembly more straightforward. • Take a hard look at the controls package. Remember, the shelf life stability of the product will be controlled by the machine. Ensure that there are clear electrical drawings. If there are not, or you’re confidence is not high enough comfortable, consider trashing the electrical panel and having another one designed and program built from scratch. Chart recorders are no match for todays technology. For the areas where engineering support is needed… whether in the utility consumption, machine sizing, or electrical controls, call a competent new machinery manufacturer and ask for their help in engineering support. They will be glad to help. Contract them for the “hard parts” of the project. They will be glad to work with you in return for the ability to provide service to the machine, which may be something that needed to be considered anyway. Feel free to write in for a list of available resources.